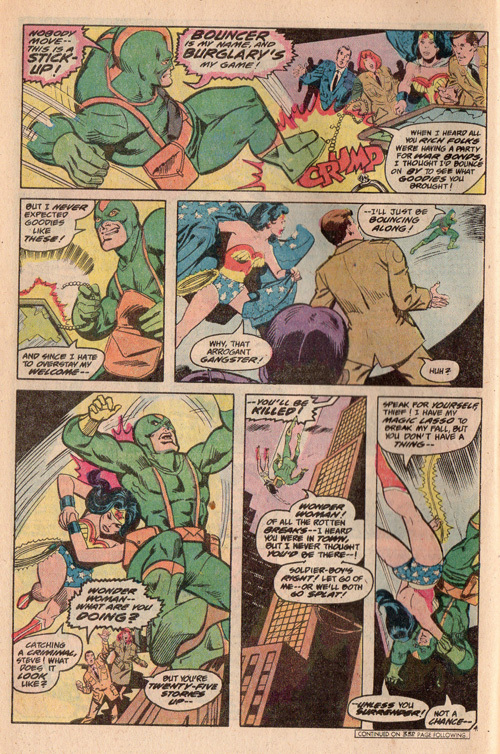 Having looked at some actual 1940s comics in the last Wonder Wednesday, now we return to that weird period in the 1970s when the Wonder Woman comic was suddenly set during World War II again, to match the first season of the Wonder Woman TV show. Well, this new villain certainly looks like a wiener. Sorry, I mean winner. 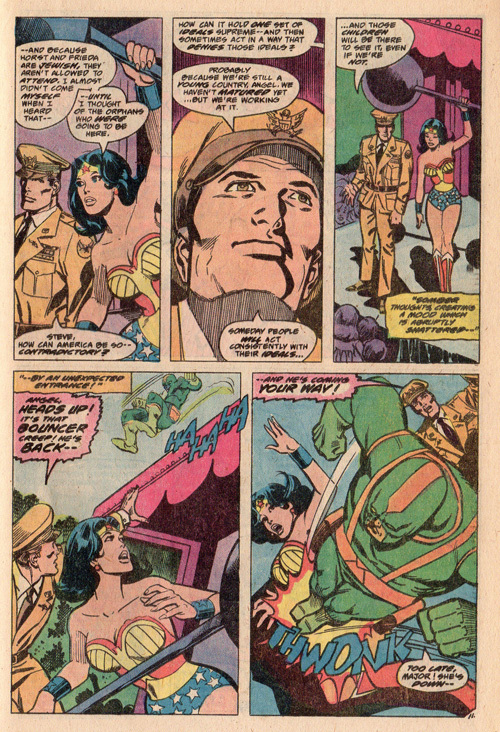 Wonder Woman #241, DC Comics, March 1978. 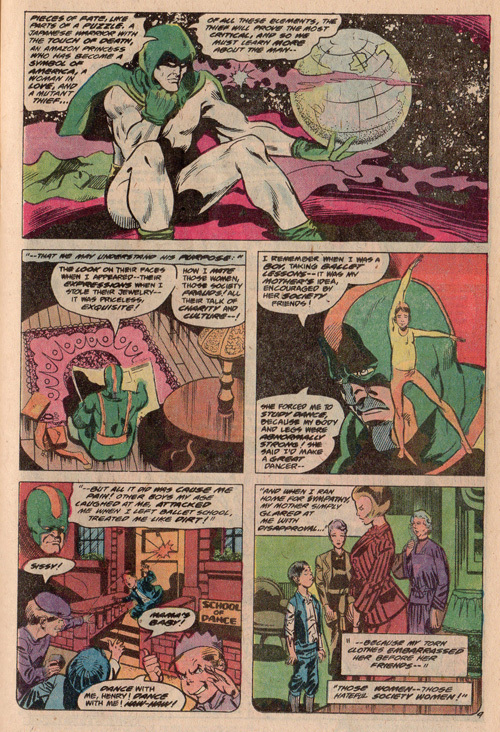 Like a number of the preceding issues, this story by Gerry Conway and guest artist Joe Staton includes a guest appearance from a fellow member of the Justice Society of America. However, whereas the JSA members in most of those other stories were not terribly helpful, this issue’s guest, the Spectre, is completely useless. The cosmically powerful ghost here functions strictly as a narrator and doesn’t interact with Wonder Woman at all. Why does this story need a narrator? No reason, really. 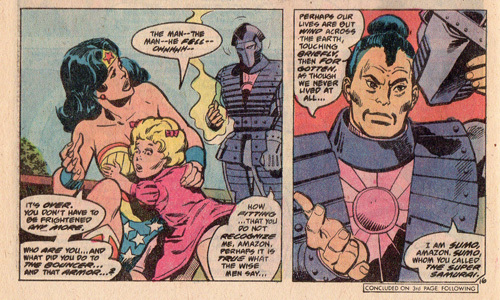 There’s a lot of buildup in this story about a mystery villain, a samurai sent by the Japanese to kill Wonder Woman with the radiation that’s also killing him. But the funny thing is, that guy’s hardly in it the story as well. Most of the tale is caught up with the guy on the cover, a good old-fashioned American super-powered thief called Bouncer. Why’s he called Bouncer? Well, stick with me here, but he bounces. That’s pretty much it. This fight should really last a few panels, tops. So, I’m not sure I even want to know, but how did he get bouncing powers? Was he blessed by the Greek god of bouncing? Bitten by a radioactive rubber ball? No, he’s just a mutant, born with this ability, and naturally decided that the best use of it was to rob people. Actually, he turned to a life of crime because he hates high society women and wants revenge on them. Why? Because the neighborhood kids used to beat him up when he was a kid, and when he got home his mother and her snooty rich friends disapproved of his shoddy appearance. Yeah, clearly the society dames are the villains in that scenario. Oh, and Wonder Woman also talks about how she’d really like to take a stand against antisemitism but doesn’t want to cause any bother. The subplot about Diana’s pal Etta Candy being romanced by some smarmy French dude who’s clearly up to no good (in fact, we know so, clued in by an incriminating thought balloon a while back) continues to drag on, although at least now Diana’s actively suspicious of the guy. And the mystery radioactive samurai? Well, it’s not really much of a mystery, because the next-issue box at the end of the previous issue already said who it was. It’s Sumo the Samurai, whom we met in the Superman vs. Wonder Woman super-sized collector’s edition. And yeah, a samurai named Sumo. Somehow this is a thing. He read that in a fortune cookie once. A, um, Japanese fortune cookie. That’s a thing, right? Mind you, Sumo shows up again later in All-Star Squadron (alongside fellow Japanese former Wonder Woman villain Kung) with all this business about him dying of radiation poisoning seemingly forgotten. So I guess he got better. There’s got to be a joke here about a phoenix rising sun, but it’s bound to be pretty lame. 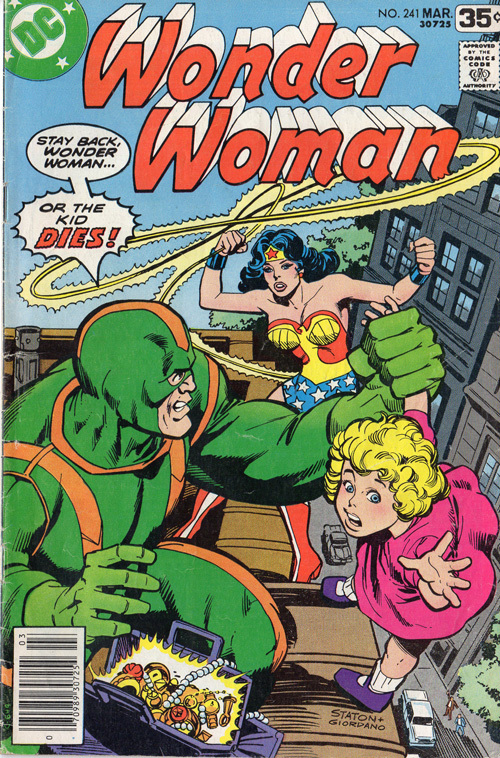 Like all the other stories between 1976 and 1987 (and many other eras of Wonder Woman, for that matter, such as 1946 to 1958), this one has never been reprinted. C’mon, DC. Give Bronze Age Wondy some love! 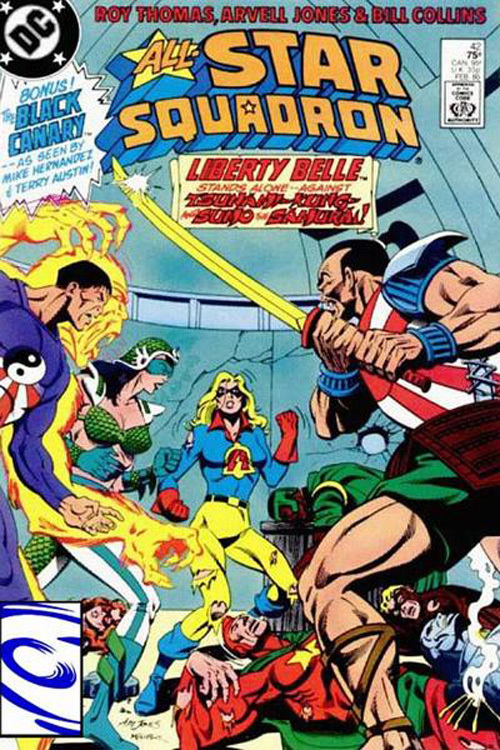 The death of Sumo here predates his appearance in the All Star Squadron. In fact, the events of the tabloid story, Superman vs. Wonder Woman would have taken place during the Young All Stars run.